Back in the day, when an automaker like the Chrysler Group was designing a ¾ ton pickup like the 2014 Ram 2500, their key concerns were how much power the engine had, how much the truck could safely tow and how much the truck could safely load into the bed. However, over the past decade or so, we have seen an influx of hard working heavy duty pickups that are fitted with features both inside and out that would have once been reserved for the likes of luxury brands. At first glance, it seems silly to some people that a truck made to tow and haul more than any other vehicle in the segment would have things like heated front and rear seats, a high tech infotainment system with one of the biggest touch screens in the industry and super plush leather that covers everything from the seats to the door panels to the dash. However, when someone is paying the kind of money that these high end work trucks demand, it would make sense that the people buying them – and driving them – would want a more comfortable cabin to get to and from the job site. While it is perfectly fine for the guys on the bottom of the ladder to drive heavy duty trucks with rubber wrapped seats and a rubber floor liner, the boss who spends his days at the work site obviously wants something more impressive to get from point A to point B while still having all of the capabilities of a proper work truck. Some skeptics continue to claim that trucks like my 2014 Ram 2500 Laramie Limited Crew Cab is designed more for the buyer who isn’t going to do much real work with the truck. I own a few trucks myself and with my wife and I running a high end horse boarding facility (and owning several horses of our own), my time with the 2015 Ram 2500 Laramie Limited offered me a chance to see if this loaded up luxury truck could still do the work of the stripped out work trucks of yesteryear. I have countless horse trailers at my disposal, literally tons of hay to move around and – best of all – I had this Ram test truck towards the end of the worst Detroit winter ever. This combination of conditions allowed me to truly put this Ram 2500 through the paces and not surprisingly, it didn’t disappoint. Of course, the brutal wintery week during which I spent driving this beast didn’t yield the best conditions for pictures of the Ram 2500 all shined up, but Mother Nature’s wrath allowed me to test this new Ram in some of the worst conditions possible. My 2014 Ram 2500 test truck was fitted with the Laramie Limited trimline, meaning that it is the top of the line for the Chrysler Group’s ¾ ton truck lineup in terms of luxury features – without hurting the work-horse abilities. Making this truck even tougher was the 6.7L Cummins Turbo Diesel engine mated to a 6 speed automatic transmission that sends 370 horsepower and a bone crushing 800lb-ft of torque to all four wheels; allowing this truck to tow an unbelievable 17,000 pounds. In addition to that monster engine, the Laramie Limited trimline packs the interior with all of the modern high tech gadgets that you could ask for in any vehicle, but that comes with a hefty price. My test truck was equipped with pretty much every option possible and that brings about a sticker price of $66,675. That is a big chunk of change, but for the site foreman who wants all of the comforts of a luxury SUV in a vehicle that can do as much work as almost any other truck on the market – this truck is a remarkably slick package. The 2014 Ram 2500 styling is somewhat similar to the smaller Ram 1500, but the 2500 features a collection of subtle cues that give it a much bigger feel. Across the front, the face of this truck has a very bold, upright feel with HID projection headlights flanking a huge chrome filled grille. To make room for the big Cummins Turbo Diesel engine, the Ram 2500 features a hood the extends further up through the middle where it reaches down to meet the grille while and extra raised central portion and louvers on both side give the truck a very aggressive, hard working look. From the front, you can also see the added clearance lights on the leading edge of the cab, adding that special work truck feel to this luxury heavy hauler. A body colored front bumper complete with dual tow hooks and fog lights complete the front end with a sportier look that I prefer over a bunch of chrome across the bottom. Along the sides of the Ram 2500 Laramie Limited, a set of unique chrome 20 inch wheels combine with the chrome side steps, the chrome door handles and the huge chrome towing mirrors to add a touch of class while the four full size doors allow plenty of space for adults to easily climb in and out of the back seating area. As a pleasant perk, the option side steps extend all of the way back to the rear wheels, allowing you easier access to anything in the front of the bed. 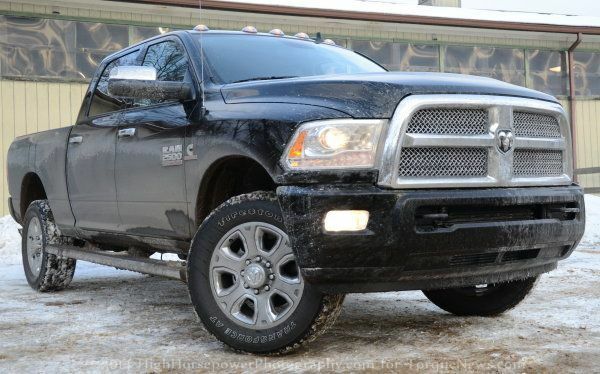 Out back, the 2014 Ram 2500 Laramie Limited has a very quiet demeanor. You won’t find any fancy dual exhaust tips, no chrome bumper and no unusually flashy badging – simply the large chrome Ram’s head in the middle with a chrome Limited badged on one side and the chrome 4x4 badge on the other. In addition to the LED taillights, the rear of this Ram 2500 features a subtle high tech feel thanks to a backup camera that is integrated into the tailgate handle and this is a feature that I really enjoyed. While I am very experienced with hooking up a truck and trailer, the location of the camera over the Class V hitch makes hooking up a breeze. As a Ram owner myself, I am a bit biased, but I really like the look of the 2014 Ram 2500. It has a big, bold feel with just enough chrome to show that this is a premium pickup – but not so much that it looks like it would be more comfortable at the country club than at a work site. It’s pretty…but not so pretty that you look like a rapper trying to show off how much money he can spend on a truck that he will never actually use. When I was a kid, a ¾ ton truck likely came with a rubber bench seat, a bare metal dash, bare metal door panels and – if the owner spent some money on the truck – a tape deck. Based on that, it is hard to imagine that in just a couple decades, the hardest working trucks sold in America would have a cabin that could make some of the world’s flashiest exotics blush but that is the beauty of the Laramie Limited package. Other than the Cadillac Escalade, I don’t think that I’ve tested a pickup truck that had more of a luxury car feel than the Ram 2500 Laramie Limited. The door panels, center console cover and seatback pockets are all wrapped in plush black leather with unique western themed decorative embroidery. White contrasting piping and stitching throughout the cabin works with the black leather to provide a very upscale feel while the soft seats offer plenty of comfort for both front and rear riders. For those up front, the seats can either heat up or blow cool air while the folks in the back “only” get heated seats…but for a group heading to a work site on a cool winter morning, four heated seating positions should prove to be a very popular feature. Needless to say, the Ram Club Cab offers a gigantic amount of space for those riding in the front and rear seats so anyone who owns this truck should have no qualms about comfortably fitting three adults in the back seat. Now, any truck owner who uses their truck for work likely knows that most jobs require you to have stuff – be it tools or paper work – and the Ram 2500 Laramie Limited Club Cab has room for it all. When you fold up the rear seats, the fold out flat loading floor makes loading anything that you don’t want sliding around the bed very easy. In terms of storage or stowage space for smaller items, the area immediately around the driver is loaded with options. A small cubby on top of the dash easily holds pens or your cell phone while a slightly large cubby at the base of the center stack offers more of the same. The huge storage compartment offers space for things like your lunch, paperwork or loose tools with two cup holders alongside and behind this area sits the big, deep center console. This two tiered console has storage for more secure items in the lid while the lower portion can serve nicely as a filing cabin drawer for those folks who need someplace to stow things like invoices or other business related paperwork. Finally, the door pockets and not one but TWO glove boxes (one in the face of the dash and one just under that) provide that much more small item storage. Oh, did I mention that there are storage compartments under the flat load floor? Because there are…and they are great for items that you don’t need every day, but might need from time to time such as tow straps, jumper cables, etc. Finally, the 2014 Ram 2500 Laramie Limited is packed full of every bit of interior technology that the Ram brand has at its disposal. The crown jewel of this cabin is the large infotainment screen mounted high in the center stack, which controls pretty much every aspect of the interior. In addition to serving as the main screen for the navigation system, the entertainment system and the hands free phone system, this infotainment screen allows you to adjust the climate control, the heated/cooled seats and all of the Apps available through the Chrysler UConnect system. You can control everything from the touch screen, but if you prefer traditional buttons and knobs you will love the 2014 Ram 2500, as it includes a panel of buttons and knobs for the radio/media system and the HVAC in addition to the elaborate spread of buttons on the front AND back of the steering wheel. Honestly, between the steering wheel buttons and voice controls, there isn’t much that you have to adjust that requires the driver to take a hand off of the steering wheel. Those controls on the steering wheel of the Ram 2500 also allow the driver to toggle through the various options in the small driver information screen mounted between the analog tachometer and speedometer. You can configure this small screen to your liking, with options like a compass, an outside temperature readout, the radio station, the name of the media file and a long list of vehicle parameters including an engine brake meter, fuel economy figures and unique gauges that are essential when towing a heavy load such as transmission temperature. Add in the push button start, the simple sunroof, the dial-control 4WD and the spread of chrome/silver trim throughout the cabin and you have yourself one of the best looking and most comfortable cabins in the entire truck segment. My 2014 Ram 2500 Laramie Limited test truck was powered by the 6.7L Cummins Turbo Diesel engine with 350 horsepower and 800lb-ft of torque being channeled to all four wheels via a 6-speed automatic transmission. This configuration can tow an advertised 17,000lbs while also being able to haul 2,175lbs, making it one of the most capable trucks in the ¾ ton segment. It should be noted that the Ram 2500 when properly configured will tow up to 17,950lbs and haul up to 3,175, which is the strongest truck in the segment…but my test truck was “only” able to tow 17,000. For all of my truck reviews, I have a standard horse trailer that weighs right around 6,500lbs when loaded up and while that is a far cry from the 17,000lbs that this truck could tow, using the same trailer for all of my reviews allows me to get a feel for how the different trucks pull the same weight. In the case of the 2014 Ram 2500 Laramie Limited, my little 2-horse trailer was like a feather. You may have heard people who tow a great deal say that their truck pulls a trailer so well that you cannot tell that there is a trailer back there…but in this case that statement is 100% true. Other than the fact that I could see the trailer in my mirrors and occasionally feel one of my horses moving around in the trailer at a stop light, the Ram 2500 accelerated like there wasn’t an extra 6,000+ pounds hooked to the hitch. Whether leaving a stop light or building speed as I entered the highway, the 6.7L Cummins Turbo Diesel engine didn’t seem to put much more effort into pulling my trailer than it did to move the unladen truck. Thanks to the integrated engine brake feature, the braking aspect of trailering my horses to the show was easier than usual, with the engine braking automatically engaging as I headed down hills while pulling. Although the engine braking feature is likely much more helpful with much heavier loads, pulling my small trailer really illustrated how well this feature works. Of course, the Ram 2500 also comes with an integrated trailer brake system that is controlled by the switch in the lower portion of the center stack, in the same place that you find the button for the traction control, the heated steering wheel, the engine brake and the heated/cooled seats. More impressively, due to the harsh winter weather conditions, I found myself pulling my horses around the area in a nasty snow storm but even on the most slippery roads – the Ram 2500 had no issues whatsoever getting my horses safely to the show. It should go without saying that packing the bed with 800lbs of hay while pulling the horse trailer also didn’t have any impact on performance on wet or snowy roads and – most surprisingly – the Ram 2500 got good enough traction in most conditions that I didn’t need to use the four wheel drive system. Overall, I would say that this Ram 2500 pulled my test trailer more easily than any truck I’ve tested thus far…including some of the big boys from Ford and GM. One situation in which I did need to lock in the 4WD on the 2014 Ram 2500 actually happened in my driveway. One morning after a particularly nasty snow storm, I looked out my front window to see a Ford F250 stuck in my driveway. I’m not real sure why the guy was in my driveway, as he want someone I knew, but he had pulled up my long driveway and then attempted to back out to the road. While doing so, he backed into the deep, hard-packed snow created by the plowing service on the side of my driveway. He had tried to dig himself out, but he had only gotten his Ford further stuck with all four wheels in the deep snow. I walked out and offered to pull him out. He replied by saying “Your little Dodge isn’t going to be able to pull me out” and he went back to digging his truck out by hand while I sat in my truck, watching and almost enjoying his struggles after his rude reply. A short while later, a friend of his showed up with another Ford Super Duty, but that truck was unable to pull him free. After about 15 minutes, he came over to my truck and sheepishly asked if I could help him out. He had a tow strap with him so I pulled the Ram 2500 over to his stuck truck, hooked up and with one quick yank, I had pulled him back onto my driveway and out of my yard. He didn’t say anything else. He didn’t thank me, he just unhooked his tow strap and left…after the “little Dodge” was able to do what his friend’s Ford was not. So the 2014 Ram 2500 Laramie Limited will tow and haul as well as any truck in the ¾ ton segment, but not everyone bases their purchase entirely on how well it works. For many people who tow a heavy load (like a large RV or a bigger horse trailer) once in a while, they need something very strong in those special occasions, but how the truck performs under load isn’t the top priority. For those folks who spend much of their drive time with their truck free of a trailer and with an empty bed, how does this truck perform? Well, with 350 horsepower and 800lb-ft of torque, it shouldn’t come as any surprise that this truck has some serious thrust when you leave a stop light in a hurry. While it takes the 6.7L Cummins diesel a split second to build adequate boost pressure needed to make 800lb-ft of torque, this truck kicks hard when it is fully spooled up. The shifts are surprisingly smooth and quick as the 6-speed automatic pops through the gears as it quickly reaches cruising speed. It isn’t going to beat up any muscle cars (at least not in stock form), but it feels quicker than any large diesel truck I’ve tested. Oh, it is also one of the few full sized trucks I’ve driven lately that will go over 100 miles per hour – or so I’ve been told. What also impressed me was that over the course of a week of driving through heavy snow, pulling a loaded trailer, hauling hay and pulling a stuck Ford out of the snow, I still averaged 13.6 miles per gallon. In looking around the internet, most owners report slightly better average fuel economy than I saw, but many of my miles driven were in rough weather under load. In terms of handling and ride quality, the 2014 Ram 2500 feels pretty much how you would expect a truck capable of towing 17,000lbs to feel. The ride is very stiff compared to your more consumer friendly half ton options, but the huge tires and heavy duty suspension do a nice job of muting some of the roads rougher bumps so while it “rides like a truck” – it really doesn’t beat you up like the older heavy duty pickups did. Overall, the ride is stiffer than the likes of the Ram 1500, but those prospective buyers will almost surely take the ride of the Ram 2500 Laramie Limited in exchange for the incredible towing and hauling capabilities. That being said, if you don’t do any towing or hauling, then you really don’t need a Ram 2500 – in which case you should buy the smoother, faster and less expensive Ram 1500. Finally, the heavy amounts of snow that fell while I was driving the Ram 2500 turned some of my area dirt roads into slushy, sloppy mud trails. These were roads where cars and rear wheel drive trucks don’t care attempt to conquer in weather like we saw this winter, and that seemed like a perfect place to test out the capabilities of this big diesel Ram. While there were some times on these muddy, sloppy roads where I did opt for four wheel drive, the ride height gave me plenty of ground clearance through the deepest ruts while the suspension system cushioned the more minor bumps in the road. Due to the weight and size of this truck, it handled these rough roads better than my Ram 1500 or some of the other half ton trucks I have tested in the past two years. The 2014 Ram 2500 is one of the most capable trucks in the ¾ ton segment and in both towing and hauling, that point was very evident during my testing. This truck will comfortably tow more than most people will ever considering pulling and haul more weight in the bed than most people who aren't moving loads of brick will ever haul. Best of all, it does all of that in addition to offering a ton of unladen acceleration that insures that you can keep up with traffic while also being surprisingly friendly to the passengers on a long highway drive. If you do any heavy towing or hauling and you want a truck that can do the work – while still being civilized enough to drive every day – this is a truck that you will most certainly enjoy. If you are looking for a heavy duty pickup that can serve as an incredibly comfortable daily driver for you and the family while also serving as one of the toughest trucks on any job site – the 2015 Ram 2500 Laramie Limited is the truck for you. The cabin is plush, roomy and comfortable enough to serve as a daily driver for even the most discriminating passengers so whether you are driving the family to grandma’s house across town or driving across the country for a family vacation, you won’t hear any complaints about the lack of niceties. At the same time, when the work week comes around, there is very little that this Ram won’t be able to do – from pulling heavy trailers and hauling heavy loads to conquering the deepest, muddiest roads and pulling stuck Ford’s out of deep snow banks. A decade back, a guy who runs a construction company or a horse stable would often have a hard working heavy duty truck for the work week while spending his evenings and weekends driving around in a vehicle that is much more comfortable and much less capable. The Ram 2500 Laramie Limited removes the need for that second vehicle – packing all of the luxury amenities that a business owner and family man wants into a truck that will be hard pressed to find a job that it cannot do very, very well. Not everyone buys these for towing or working. I am just like the stereotypical rapper u mentioned. I'm not a rapper, but I just bought the truck to use as a car and show off at the golf course and tennis club. Don't hate me, lol. By the way I got the 2500 not 1500 cause I wanted a mega cab. Got with Air Ride and she rides smooth and floaty, not stiff! No hating here, Jack. I understand that not everyone who buys one of these trucks without the need to tow or haul is a rapper, but it seems that the music and sports star community loves to buy HD trucks and "bling them out". As for the ride, I really liked how it rode as trucks go, but many people who arent used to a real truck are likely to find this truck to offer a pretty stiff ride..in my opinion, of course. Thanks for reading and commenting! Again, don't hate, but I kinda wanted to trick out my HD with spinners, Lights, Air-horns, etc.. I Know I'll probably only see off-road action, if I back over a flower bed. And I use my bed to haul groceries, LOL. Guess I'm not your typical HD driver, but I do enjoy my truck. If the mega cab was available in 1500, I woulda done that. I was just looking for a more rugged alternative to the traditional luxury car route (Caddy, BMW, Lincoln, Lexus, etc.) As for ride, I've never had a truck, but do own 2 Lincoln Town Cars. This 2014 2500 with Air Ride is my first truck ever, and while your description may apply to the coil Spring versions, my Air-Ride rig is just as smooth and floaty-soft, as my 2 Town Cars...I kid u not. At your leisure, please test drive 1. This was a newly available Option, as my dealer indicated mine was the first ever ordered from his dealership. While not as 'blinged out' as the Limited, I'm very happy with my Ram - I have a 2011 4x4 Sport Crew Cab upgraded with most of the luxury options - Heat/AC seats, leather, nav/dvd, etc. I get the awesome rumble from the 5.7 Hemi with the factory tuned exhaust, but it's like driving a Cadillac on the inside. I like the Limited but the features it had over what mine does weren't worth another 20+K to me. I do understand lots of people will pay that just to have the big chrome 'Limited' across the back but that's a colossal waste of money unless your self worth is wrapped up in what other people think of you. So I agree with the OP - there's a real market for luxury trucks that are capable. I work with mine - haul/tow and occasionally take it off-road, but I really like being uber comfortable and being able to haul around 4 people and/or a trailer behind me. It's like having 3 vehicles in one. This truck is faster and more powerful than 1500. That's why I bought her. I don't tow anything, but I wanted to show off that I have the biggest, baddest, fastest over the top truck to show off at the country club. My question is. Are those front towbars extendable.? Can u push a button that extends out n back in? ?